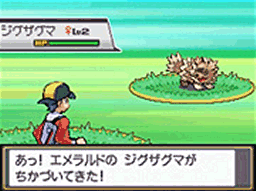 Pal Park makes a return in HeartGold & SoulSilver. 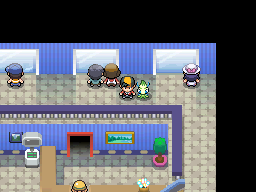 Like in Diamond, Pearl & Platinum, it works in allowing you to migrate six Pokémon at a time oevr from the GBA games (Ruby, Sapphire, Emerald, FireRed & LeafGreen) if you are playing on a DS or DS Lite with those games in. It is located within Fuchsia City, and you are able to use it's facilities as soon as you have access to it, with the menu option arriving in the main menu before you load the game. However, there is a difference to the HeartGold & SoulSilver Pal Park. In Diamond, Pearl & Platinum, the games limited you to being only able to transfer six Pokémon from a particular GBA game within 24 hours. This feature has been removed in HeartGold & SoulSilver so you have the ability to transfer as many Pokémon as you want in a single day, just six at a time. #01 Cheri Berry A Poffin ingredient. It may be used or held by a Pokémon to recover from paralysis. #02 Chesto Berry A Poffin ingredient. It may be used or held by a Pokémon to recover from sleep. #03 Pecha Berry A Poffin ingredient. It may be used or held by a Pokémon to recover from poison. #04 Rawst Berry A Poffin ingredient. It may be used or held by a Pokémon to recover from a burn. #05 Aspear Berry A Poffin ingredient. It may be used or held by a Pokémon to defrost it. #06 Leppa Berry A Poffin ingredient. It may be used or held by a Pokémon to restore a move’s PP by 10. #07 Oran Berry A Poffin ingredient. It may be used or held by a Pokémon to heal the user by just 10 HP. #08 Persim Berry A Poffin ingredient. It may be used or held by a Pokémon to recover from confusion. #11 Figy Berry A Poffin ingredient. If held by a Pokémon, it restores the user’s HP in a pinch, but may also cause confusion. #12 Wiki Berry A Poffin ingredient. If held by a Pokémon, it restores the user’s HP in a pinch, but may also cause confusion. #13 Mago Berry A Poffin ingredient. If held by a Pokémon, it restores the user’s HP in a pinch, but may also cause confusion. #14 Aguav Berry A Poffin ingredient. If held by a Pokémon, it restores the user’s HP in a pinch, but may also cause confusion. #15 Iapapa Berry A Poffin ingredient. If held by a Pokémon, it restores the user’s HP in a pinch, but may also cause confusion. #09 Lum Berry A Poffin ingredient. It may be used or held by a Pokémon to recover from any status problem. #10 Sitrus Berry A Poffin ingredient. It may be used or held by a Pokémon to heal the user’s HP a little. #16 Razz Berry A Poffin ingredient. Bury it in soft soil to grow a Razz Plant. #17 Bluk Berry A Poffin ingredient. Bury it in soft soil to grow a Bluk Plant. #18 Nanab Berry A Poffin ingredient. Bury it in soft soil to grow a Nanab Plant. #19 Wepear Berry A Poffin ingredient. Bury it in soft soil to grow a Wepear Plant. #20 Pinap Berry A Poffin ingredient. 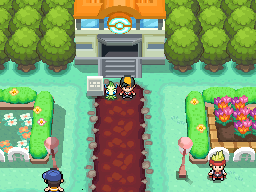 Bury it in soft soil to grow a Pinap Plant. #21 Pomeg Berry A Poffin ingredient. Using it on a Pokémon makes it more friendly, but it also lowers its base HP. #22 Kelpsy Berry A Poffin ingredient. Using it on a Pokémon makes it more friendly, but it also lowers its base Attack stat. #23 Qualot Berry A Poffin ingredient. Using it on a Pokémon makes it more friendly, but it also lowers its base Defense stat. #24 Hondew Berry A Poffin ingredient. Using it on a Pokémon makes it more friendly, but it also lowers its base Sp. Atk stat. #25 Grepa Berry A Poffin ingredient. Using it on a Pokémon makes it more friendly, but it also lowers its base Sp. Def stat. #26 Tamato Berry A Poffin ingredient. Using it on a Pokémon makes it more friendly, but it also lowers its base Speed stat.